We send our most experienced staff to explain our approach of “exercising creativity” and answer all of your questions so we ask that a parent join us for the full hour. Select a convenient date/time at one of our studios and register each child individually. Email us if you can’t find one that suits your schedule. 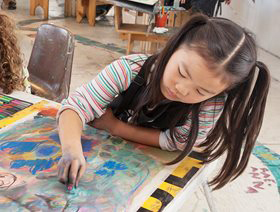 Free art lessons are posted monthly and cannot be exchanged for regularly scheduled classes. Please register each child individually.